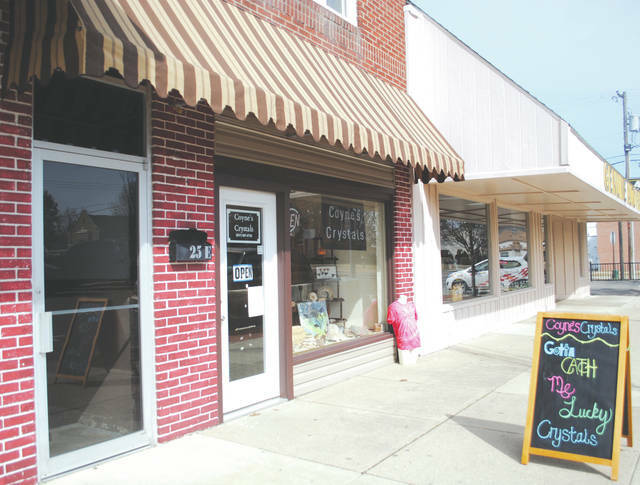 Whitney Vickers | Greene County News Coyne’s Crystals in Fairborn is located at 25 W. Main St. and offers gems, minerals, fossils, tie dye shirts, essential oils, hand-crafted jewelry and more. FAIRBORN — Frances Coyne, owner of downtown Fairborn shop Coyne’s Crystals, describes herself as an artist. But she does not use brushes, pencils or paper. Instead, her canvases are rocks. Coyne hand-picks each gem and mineral on sale at her shop and wraps and wires the stones to create jewelry along with her business partner and cousin Crystal Gibson. Gibson additionally handles the social media aspect of the business, which also sells products online. Coyne, a Fairborn native, birthed a “passion and hobby that grew on us,” she said, while on a soul-searching mission in Arizona in 2003 when she discovered mining and started rock carving. On a former trip out to Arizona, she brought back 1,000 pounds of rocks. As she mined, she learned the mineral content of the rocks and started to understand why some individuals believe in a metaphysical aspect of the materials. Coyne said she believes it is all “inter-connected,” and enjoys getting creative and making the stones into jewelry. She later started street vending some of her findings and creations. Coyne said she got by with support from her boyfriend, Phil Smith, as well as Gibson. 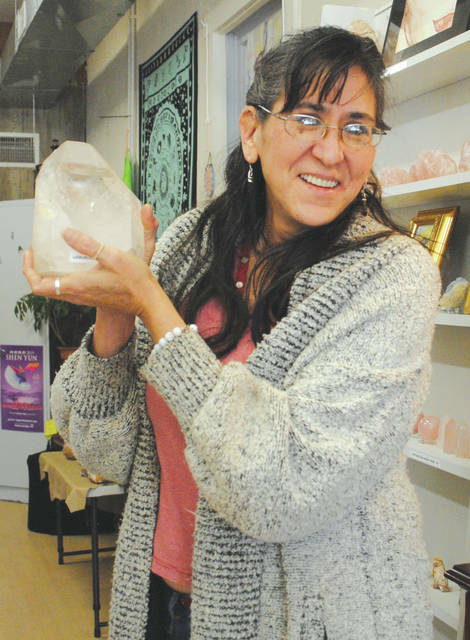 She opened Coyne’s Crystals in June 2018 in a space below Kai Yoga Studio on Main Street. By October 2018, she had outgrown her space and moved to 25 W. Main St., where the shop remains. Coyne grew up in Fairborn, graduating from Baker High School. Five generations of her family have made the community their home. Coyne’s Crystals is open 11 a.m. to 5 p.m. Tuesday through Saturday and is located at 25 W. Main St. For more information, visit the website at https://bit.ly/2NYVnEU or its Facebook page at https://bit.ly/2u5IXCc. The shop not only offers gems, minerals, fossils and jewelry, but art, tie dye shirts and essential oils as well. 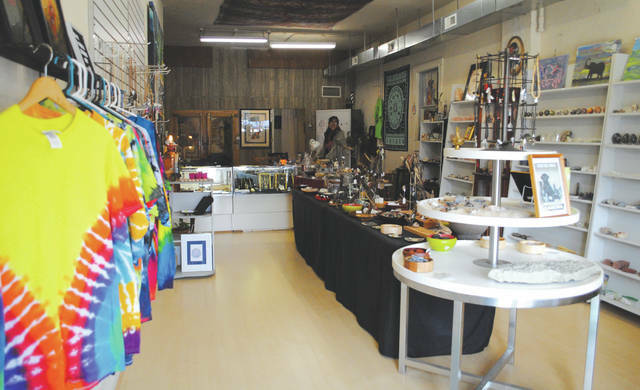 https://www.xeniagazette.com/wp-content/uploads/sites/32/2019/03/web1_coynes1.jpgWhitney Vickers | Greene County News Coyne’s Crystals in Fairborn is located at 25 W. Main St. and offers gems, minerals, fossils, tie dye shirts, essential oils, hand-crafted jewelry and more. https://www.xeniagazette.com/wp-content/uploads/sites/32/2019/03/web1_coynes4.jpgWhitney Vickers | Greene County News Coyne’s Crystals in Fairborn is located at 25 W. Main St. and offers gems, minerals, fossils, tie dye shirts, essential oils, hand-crafted jewelry and more.